The $5.4 million project to reconstruct Lorne St. will be going ahead next summer now that the federal and provincial governments have agreed to pay 75 per cent of the cost. Sackville’s town engineer, Dwayne Acton, says phase one will include replacement of water, sewer lines and storm drainage systems as well as sidewalks, curbs, gutters and ditches. 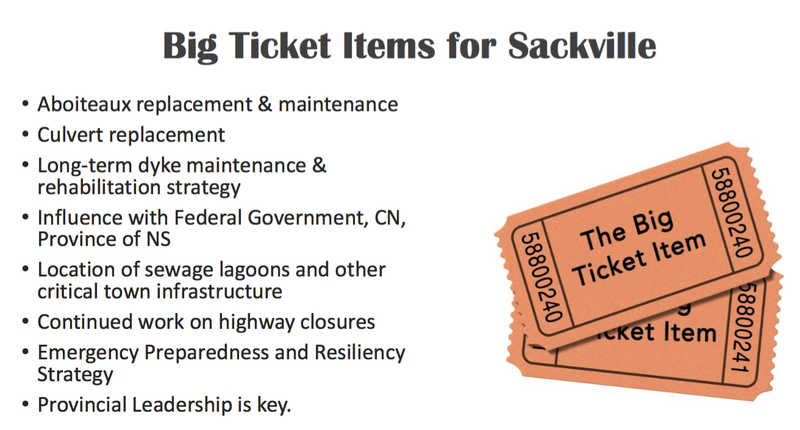 At its meeting last night, Sackville Town Council authorized Acton to seek additional federal-provincial funding for phase two which would include building structures to drain water from the flood-prone street through the dyke, into the Tantramar River and out to the Bay of Fundy. At last night’s meeting, council also heard about Mayor John Higham’s presentation to the New Brunswick legislature’s committee on climate change which held hearings in Sackville on August 31st. 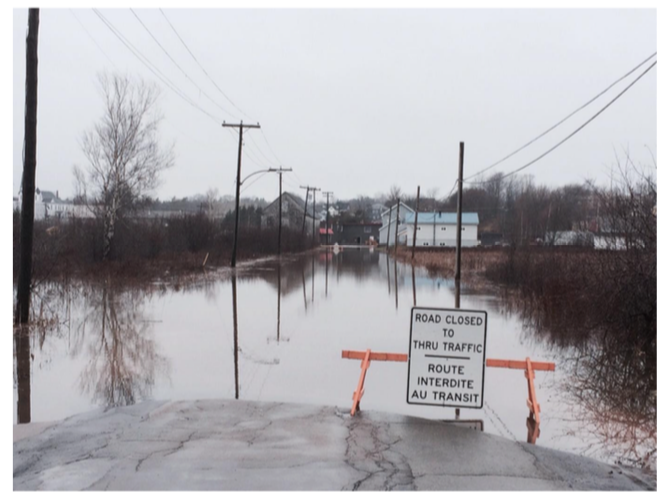 The mayor pressed the provincial government for more financial help in coping with the rising tides and severe rain storms that not only threaten Sackville, but also critical links such as the Trans Canada highway, the CN rail line and the electrical transmission grid between New Brunswick and Nova Scotia. In an interview later, Higham quoted a scientific study commissioned by the Atlantic provinces and the federal government which estimates that if the rail and highway links were flooded by dyke failures, the Canadian economy would lose at least $50 million a day because of the interruption in commercial traffic. Higham also argues that the province needs to give municipalities access to more sources of revenue to help pay for measures to offset the effects of climate change. He says, for example, municipalities could benefit from revenues generated by alternative energy sources such as solar panels and wind turbines. “It’s happening in Nova Scotia where they have alternative energy licences, but it just doesn’t seem to be happening in New Brunswick,” he says, except at the landfill in Moncton where they’re installing a turbine to generate electricity by burning methane gas emissions. Meantime, in its letter to the legislature’s committee on climate change, EOS Eco-Energy also promotes the environmental and economic benefits of alternative, renewable energy. Among other things, the Sackville environmental group says New Brunswick could promote itself as the sunniest province in winter and the solar energy capital of Canada. To view Mayor Higham’s presentation, click here. This entry was posted in Environment, Town of Sackville and tagged climate change, Dwayne Acton, EOS Eco-Energy, flooding, Lorne St., Mayor John Higham. Bookmark the permalink.